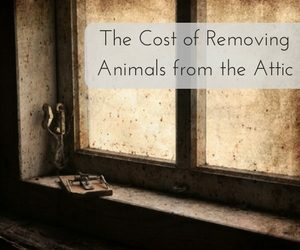 The largest factors in determining the cost of animal removal are the type of animal, and how many of them are inhabiting your home. The smaller the infestation is and the less dangerous the animal, naturally, the lower the cost of removal. We always recommend getting help at the first sign of an infestation, and that not only helps prevent damage to your home, but it keeps the cost of removal down as well. Removal techniques vary depending on the type of animal being dealt with, which in turn can affect the overall cost as well. When we conduct our preliminary inspection, we always try to determine what condition the animal is in, as it affects the techniques we use for removal. Deceased animals only require carcass removal, whereas an injured or healthy animal should be humanely removed and relocated when possible. If the nuisance animals are nesting in a hard-to-reach area of your attic, or the weather conditions are dangerous, additional tools or time may be necessary to remove the animals safely. Though the only way for us to accurately price your animal removal needs is with an inspection, our clients typically pay between $100 and $300 for their animal removal needs. To keep costs and damage to a minimum, do not wait to take action when you notice wild animals in or around your home. Call Critter Control® of Tampa a call today at 813.948.0870 with questions, or to schedule your home consultation.